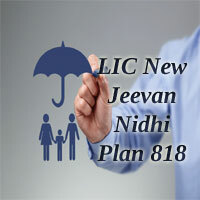 LIC New Jeevan Nidhi (Plan 812) is conventional with profits pension policy with a combination of saving and protection features. LIC Jeevan Nidhi Plan provides for death cover during the defer period and offers an annuity on survival to the date of vesting. The new UIN (Unique Identification Number) for LIC’s New Jeevan Nidhi Pension plan is 512N271V01. The New Jeevan Nidhi Pension Plan ensure the life assured to get a good monthly pension after retirement. LIC Jeevan Nidhi Pension Plan ensures that you lead a happy life on your terms even after retirement. New Jeevan Nidhi Pension plans present you financial security so that when your professional income starts to decrease gradually, you can still live with pride on your living standards without compromising. Due to the rising inflation, & high cost of living & inflation, retirement planning has become the most significant. So, It is important to start saving early for a stress-free, comfortable retired life. New LIC Jeevan Nidhi provides an options to choose your retirement age and control your investments are managed to meet your retirement needs. This New LIC Pension plan helps you to do the things what you always have been doing even after Retirement. Let’s have a look at the salient features offered by the LIC New Jeevan Nidhi Pension Plan (818) in the following section. LIC New Jeevan Nidhi Annuity Plan is a Conventional Deferred Pension Plan. Guaranteed Additions: The Jeevan Nidhi Pension Plan provides Guaranteed Additions at the rate of Rs. 50/- per thousand Basic Sum Assured for each completed year, for the first 5 years. Participation in Profits: This LIC New Jeevan Nidhi Policy allows participation in Profits in the form of Bonus from the 6th policy year onwards. The Accidental Death and Disability Benefit Rider offered by LIC is available under this plan as an optional rider. Two Options available on Maturity: Purchase deferred annuity OR Purchase immediate annuity. The Minimum Accident Benefit Sum assured has been increased from Rs. 25,000/- to Rs. 1,00,000/-. Under Single Premium: 60 years (Completed). Under Regular Premium: 58 years (Completed). Under Regular Premium: Rs. 1,00,000/-. Under Single Premium: Rs. 1, 50,000/-. No Limit (The Basic Sum Assured shall be in multiples of Rs.5000/-) (in years). Under Single Premium: 5 years to 35 years. Under Regular Premium: 7 years to 35 years. Regullarly: Monthly (ECS, SSS), Quarterly, Half-Yearly, Yearly. Let us check the benefits available under LIC Pension Plan – LIC New Jeevan Nidhi in the following Section. Free Look Period: If the Life insured is not satisfied with the “Terms and Conditions” of the LIC Jeevan Nidhi Retirement plan, she/he may return the insurance policy to the Corporation within 15 days from the date of receipt of the policy. Death Benefit: The total Death Benefit at any time shall not be less than 105% of the total premiums paid which excludes extra premiums, taxes, and rider premium if any. Death during first 5 policy years: Provided the Pension policy is in full force. The nominee will get the Sum Assured + Accrued Guaranteed Additions which can be paid in a lump sum or partly in lump sum and balance in the form of an annuity to the nominee, provided all premiums have been paid. Death after first 5 Policy years: The legal heir will be provided the Basic Sum Assured + accrued Guaranteed Additions + Final Additional Bonus + Simple Reversionary, if any, which can be paid in a lump sum or as the annuity or a combination of the two, provided all premiums have been paid. Benefit on Vesting: On vesting an amount equivalent to the basic Sum Assured along with accumulated assured additions, vested simple revision bonuses and Final Additional bonus, if there are any, will be provided to the Life assured. The given options shall be available to the policyholder for utilization of the benefit amount. To purchase an immediate annuity. To purchase a new Single Premium Deferred pension product. Tax Benefit: The Premiums paid under LIC Jeevan Nidhi Pension Plan are exempted from tax under Section 80C, Income Tax Act, 1961. Guaranteed Additions: The LIC New Jeevan Nidhi Plan provides Guaranteed Additions @ Rs. 50/- per thousand Basic Sum Assured for each completed year, for the first 5 years. Premium Rate: The table premium rates per Rs. 1000/- Basic Sum Assured are encompass in I-Annexure. Class-I extra premium rates per Rs. 1000/- Basic Sum Assured are enclosed in Annexure – II. LIC Accidental Death and Disability Benefit Rider: An optional rider is available as LIC Accidental Death & Disability Benefit Rider by payment of additional premium under regular premium policies. In the case of accidental death, the Accidental Benefit Sum Assured will be payable as lump sum along with the death benefit under the basic plan. The Accident Benefit Sum Assured amount may opt for an amount upto the Basic Sum Assured subject to the minimum of Rs. 1,00,000/- and the maximum of Rs. 50,00,000/-. This LIC Accidental Death and Disability Benefit Rider benefit will be available only until the vesting age. Let us check the LIC’s New Jeevan Nidhi Pension Plan Rebates here. The LIC Jeevan Nidhi Pension Plan buying procedure is available here. Before purchasing the LIC new Pension Plan- New Jeevan Nidhi, read the Plan details carefully. This LIC New Pension Plan can be purchased in two ways either online or offline. For Online mode refer the LIC India Official Website. For offline mode, Visit the nearest LIC Branch Office or Contact an LIC Agent of superior guidance. Get the documents required for the LIC new Pension Plan 818 here. Proposal Form 300 / Application Form along with the Photograph. The Life Assured can claim the Pension plan offered by LIC, India after the completion of the policy period. In the case of eventual death of the annuitant, the nominee can claim instead of the insured. Check the documents required for Claim the LIC new Jeevan Nidhi Pension Plan here. LIC Jeevan Nidhi Premium Calculator is used to calculate Premium amount for yearly, half-yearly, quarterly and monthly of any Policy. This New LIC Pension plan calculator is used to estimate the benefits offered by the Jeevan Nidhi Plan. Jeevan Nidhi Plan 818 Pension Calculator provision helps clients to calculate the premium amount and amount paid to the insured after maturity. For more details regarding LIC New Jeevan Nidhi Premium Calculator refer, www.policybook.in. Grace Period: A Grace period not less than 30 days will be allowed for payment of yearly or half-yearly or quarterly premiums and 15 days for monthly premiums. Service Tax: Under LIC New Jeevan Nidhi Plan, the amount of service tax as per the prevailing rates shall be payable by the life assured on premium, as and when the policy premiums are paid. Surrender Value: The LIC New Jeevan Nidhi Policy can be surrendered at any time after completion of at least 3 policy years but before the date on which pension vests. No loan will be available under the New Jeevan Nidhi Policy. Suicide Clause: LIC New Jeevan Nidhi shall be void if the policyholder commits suicide at any time within one year from the date of start of risk. The Insurance Company will not entertain any other claim by this policy except to the extent of a maximum of 90% of one-time premium paid excluding any extra premium. The regular procedure for reinsurance shall apply.